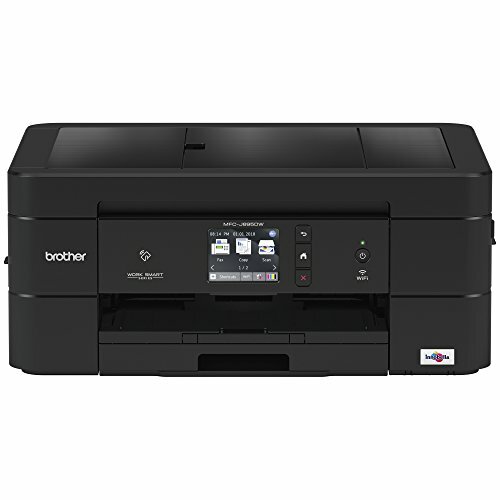 The Brother Work Smart Series MFCJ895DW all-in-one color inkjet printer is easy-to-connect, compact, economical, and loaded with features and functionality to make it essentially the perfect printer for your home, home office or dorm room. This wireless color inkjet all-in-one printer delivers high quality, reliable printing, copying, scanning, and faxing in a desk-friendly footprint that fits just about anywhere. The MFC-J895DW offers automatic duplex (two-sided) printing that helps save paper. The MFC-J895DW offers mobile device printing(1) that lets you print wirelessly from your desktop, laptop, smartphone or tablet(1). Use the 150-sheet capacity paper tray for generous output without constant monitoring or refilling. The automatic document feeder and bypass tray handle a variety of sizes and specialty papers. Cloud connectivity lets you print-from and scan-to popular cloud services directly from the printer including Google Drive, Dropbox, Box, OneDrive, Evernote and more(2). You can also easily capture and convert documents using Brother Cloud Apps(3). Ink replacement is a snap with separate ink cartridges that easily pop in and out. High-yield replacement cartridges help you save with every printed page. The 2.7” color touchscreen display lets you easily navigate onscreen menus to simplify workflows. No network setup needed for Near Field Communications (NFC) one “touch to connect” mobile device printing and scanning(4). Includes a two-year limited warranty and free online, call or live chat support for the life of the printer. (1)Requires connection to a wireless network. (2)Requires an Internet connection and an account with desired service. (3)Requires internet connection. (4)The mobile device must have NFC capability and run Android OS 4.4 or later. (5)Reprinted from pcmag.com with permission. Copyright 2017 Ziff Davis, LLC. All Rights Reserved. (6)Based on ISO/IEC 24734 (after first set of ISO test pages). For more details, visit manufacturer’s website. SIMPLE TO CONNECT: Versatile connection options with built-in wireless, Ethernet, or connect locally to a single computer via USB interface. MOBILE PRINTING: Print wirelessly from mobile devices(1) using AirPrint, Google Cloud Print, Brother iPrint&Scan, Mopria and Wi-Fi Direct. CLOUD CONNECTIVITY: Print-from and scan-to popular Cloud services including Google Drive, Dropbox, Box, OneDrive,(2) directly from the MFCJ895DW. NEAR FIELD COMMUNICATIONS (NFC): No network setup needed for NFC one "touch to connect" mobile device printing and scanning(4). AMAZON DASH REPLENISHMENT ENABLED: Upon activation, Amazon Dash Replenishment measures the ink level and orders more from Amazon when it's low. If you have any questions about this product by Brother, contact us by completing and submitting the form below. If you are looking for a specif part number, please include it with your message.